The number of dairy herds in the north east and the north of Scotland is a tale of woe. In the first six months of this year, the Scottish Dairy Cattle Association revealed that we now have just 28 dairy herds in Aberdeenshire (I was surprised there were this many), five in Moray, just one in Forth and Cromarty and the same in Inverness-shire. The closing of the Muller-Wiseman milk processing plant in Aberdeenshire, and the subsequent milk haulage charges of 1.75ppl to transport farmers’ milk to southern Scotland, has made a tough situation even tougher. Our farmers explored alternative processing models locally, but they weren’t viable. Retaining dairy herds in our region will necessitate new thinking and adding value locally; the haulage charge puts our dairying at a competitive disadvantage, which can only be sustained for so long. In its 2017 Agricultural Statistics report, Aberdeenshire Council emphasised that successful local dairies have survived through exhibiting differentiation, by, for example, producing high quality cheeses or fresh yoghurts. Three local businesses which have diversified into dairy-based enterprises have fascinated me. They have tackled, and profited from, their predicament. The longest running is the Groat family’s Devenick Dairy. They started making their own products – now including cheese, yoghurt and rose veal – in 2006; and have recently opened their Tin Coofarm shop and café. The family have rooted their brand in being from Aberdeenshire, with cheese names like the Coos R Oot, Fet Likeand Granite City. They sell countrywide. 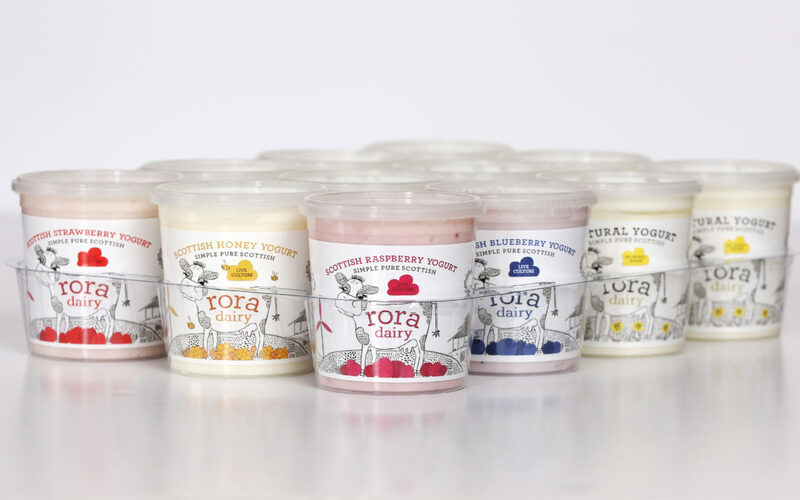 North of Aberdeen, just outside Peterhead, is home to rora dairy, the brainchild of Jane Mackie, who has been determined to play her part in keeping the family’s farm in dairying. Jane makes a delicious range of stunningly branded Scottish yoghurts using their own milk, and with a CV steeped in relevant business experience, she is perfectly equipped to build a really successful food business. Launched in the summer of 2017, she now has six lines, including raspberry, strawberry and honey flavours, using Scottish ingredients. The newest diversified kids on the block are the Willis brothers, who installed a milk vending machine in December 2017 on their organic farm at Glasgoforest just off the A96 west of Aberdeen. Will and Angus have used the power of social media – particularly Instagram – and their location to build their brand and sales. Their milk retails for £1.20/litre and the venture has been so well supported, they had to install another vending machine earlier this year. Whilst the investment in food manufacturing or selling direct might not be for everyone, doing different is vital for dairying to endure in our region. With 24,000 coffee shops in the UK, maybe we should be talking to these chains about a premium Scottish milk brand?